Bouchra Jarrar, Spring 2015 Couture. Photograph courtesy of Style.com. There are some who consider Bouchra Jarrar’s approach to haute couture outdated—day clothes and minimal theatricality? That seems awfully reminiscent of the stuffy haute couture of a bygone era— when designers like Mainbocher, Elsa Schiaparelli or later King Cristobal Balenciaga and Christian Dior reigned over their salons and presided over the women they dressed. Haute couture, which literally translates as “high sewing” in French, was the prevailing industry since its inception around the 1850s up until its demise in the 1960s. House of Worth ball gown, ca. 1872. Photograph courtesy of the MET Museum. Quintessential couture “late-day” looks by Christian Dior and Grés. 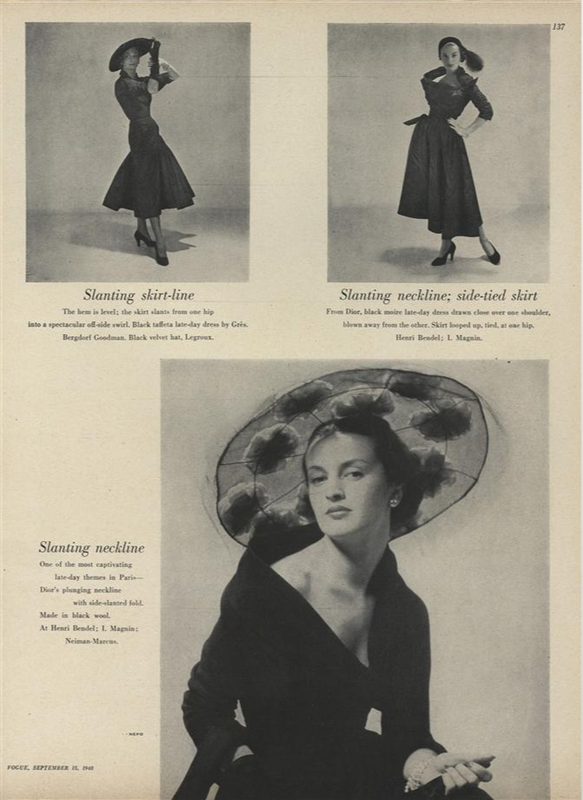 Vogue September 15, 1948, 137. 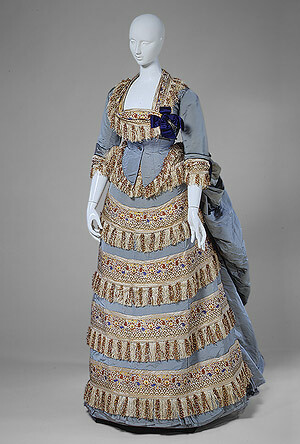 Charles Frederick Worth, widely regarded as the progenitor of the fashion industry as we know it today, launched his couture house in 1857-58 and fully established the role of the fashion designer as illustrious créateur. For those who are unfamiliar, haute couture, as aptly put by Vanessa Friedman of the New York Times, is even more so today regarded as “that most rarefied of fashion forms, clothes that are made to order by hand for the 0.001 percent who can afford them.” At its height in the mid-1940s, haute couture was an industry strictly regulated by the Chambre Syndicale. Couturiers applied for membership and fulfilled a series of requirements in order to be classified as a couture house. 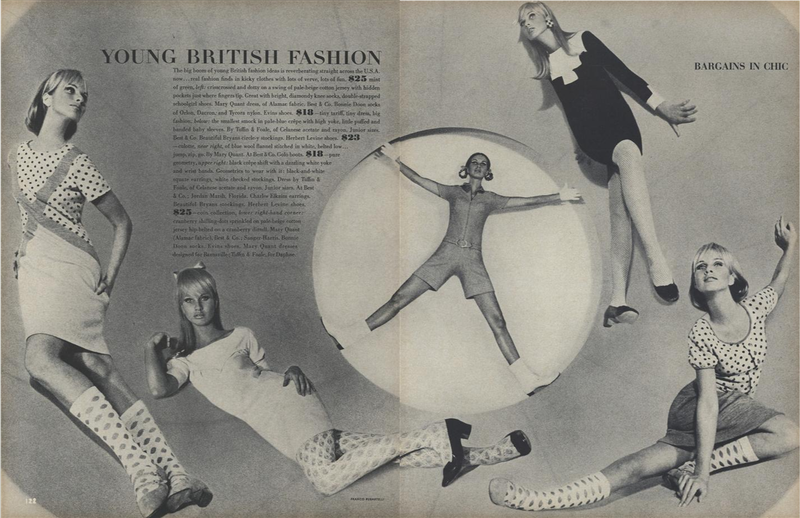 Young British Youthquake fashions of the 1960s featuring ensembles by Mary Quant and Foale & Tuffin. Vogue, August 15, 1965, 122-123. For the client, this meant an elaborate process of showings, selection, and multiple fittings before finally receiving an order. The haute couture remained highly influential up until the early 1960s and quickly became irrelevant as women changed drastically. They no longer dedicated their entire lives to the pursuit of elegance and now looked to their youthful daughters for fashion inspiration. What had once been fiercely guarded by couturiers from flagrant copyists quickly transgressed to becoming a “hard sell” as stiff competition from ready-to-wear designers picked up steam. The haute couture transformed into a laboratory for experimentation— a place where couturiers could work out ideas for their more profitable ready-to-wear lines. Couturiers also took cues from the hipper ready-to-wear designers like Kenzo Takada for their fashion shows and moved out of their intimate salons into larger venues. In general, fashion shows began to evolve into the spectacles we know today— replete with lights, arena seating, music, props, photographers and celebrities. Christian Dior by John Galliano’s sensational haute couture show. Vogue, October 1998, 134. As couture lost touch with reality, the clothes, too, moved increasingly towards fantasy. Vogue in March of 1991 wrongly predicted that “spectacular fashion shows may become a casualty of the cautious 1990s,” and that “ostentatious display may become distinctly unfashionable.” Instead, fashion shows, spurred by John Galliano’s outrageous designs for Christian Dior or bad boy Alexander McQueen at Givenchy, transformed into “publicity vehicles” for brands. Bouchra Jarrar, Spring 2012 Couture. Photograph courtesy of Style.com. Thus, when reconsidering Jarrar’s couture collection for Spring 2015 within this historical context, it is, by comparison, incredibly novel, not to mention, daring that a 21st century designer would upend the current expectations of couture and return to its roots. Although it has been surmised that Jarrar, along with her peers, may be reacting to the current economic climate, which took a turn for the worse recently with the Euro at a historic low and the Ruble, which lost fifty percent of its value in just one year. But Jarrar, since her outset, has shied away from theatrical sets or red carpet-worthy gowns, and instead, has consistently shown ultra-wearable yet supremely luxurious day clothes for the modern woman. Her approach strips away the layers of fantasy while upholding couture-level standards through unsurpassed workmanship and the use of the finest fabrics that are oftentimes woven especially for her. Highlights include a precisely cut white button-down shirt, paired with a houndstooth and leather miniskirt is accessorized with a oversized fox fur collar; or an ivory silk crepe long-sleeved evening gown with a beautifully draped cowl neck. Perhaps the couture details are imperceptible through a 2D computer screen, but consider that Jarrar also maintains a ready-to-wear line. Beyond the more tactile aspects of couture, these clothes are made-to-measure for the specific wearer, which means clothes that fit like a dream. These are highly wearable, timeless clothes for women of the 21st century who adore the art of dress. Rather than creating a fruitless couture collection that will go straight to the storied vaults of museums, without any sort of provenance, or worn merely once as it floats over a red carpet, why not provide a more sustainable alternative for the wealthiest .001%? Middle class arbiters of fashion have long touted “Investment dressing”—buying fewer pieces but of higher quality rather than partaking in fast fashion. Who says this methodology can’t extend to the world’s wealthiest few while supporting the art of dress? John Galliano for Christian Dior Haute Couture. Vogue, March 1997, 190. Highly unwearable Victorian influenced collections at the haute couture shows of Christian Dior by John Galliano, Christian Lacroix, and Givenchy by Alexander Mcqueen. Vogue, November 1997, 178. Extravagant haute couture pink fan gown by Jean Paul Gaultier Vogue, March 1999, 392. Vanessa Friedman, “Couture Tries to Find Its Place in the Real World,” New York Times, January 30, 2015, http://www.nytimes.com/2015/02/01/fashion/couture-tries-to-find-its-place-in-the-real-world.html?action=click&contentCollection=Fashion%20%26%20Style&region=Footer&module=MoreInSection&pgtype=article (accessed February 2, 2015). Requirements included but were not limited to: the couture house must be based in Paris; a collection consisting of at least twenty-five designs, created in-house twice a year for spring and fall and crafted on a live model; the collection must be presented on live models in an “appropriate” setting. The regulations also covered the technical execution and client reproduction, etc. For a broad overview: Alexandra Palmer, “Haute Couture,” The Berg Companion to Fashion, ed. Valerie Steele, Berg: New York and Oxford, 2010, 393-396. Marilyn Bender, The Beautiful People, New York: Coward-McCann, Inc., 1967, 206. Bernadine Morris, “Fashion: Top Secrecy to Hard Sell,” New York Times, January 4, 1978, C11. “Eye View,” WWD, January 30, 1975, 8. Bernadine Morris, “Paris Finale: Tradition and Innovation,” New York Times, July 30, 1982. “Fashion’s Fantasy Lab,” WWD, September 1, 1998, 178-179, 182, 184-185. Nicole Phelps, “Review: Spring 2015 Couture Bouchra Jarrar,” Style.com, January 27, 2015, https://docs.google.com/document/d/1cXauZBn6n0HZFxfqv9tEA1RnCihjfVI2T622N6HRfEo/edit# (accessed February 4, 2015).